The threatening speeches between the US and North Korea is leaving enormous impact on pairs, commodities and stocks. As USD is again under pressure, traders are looking ahead for the US CPI data. 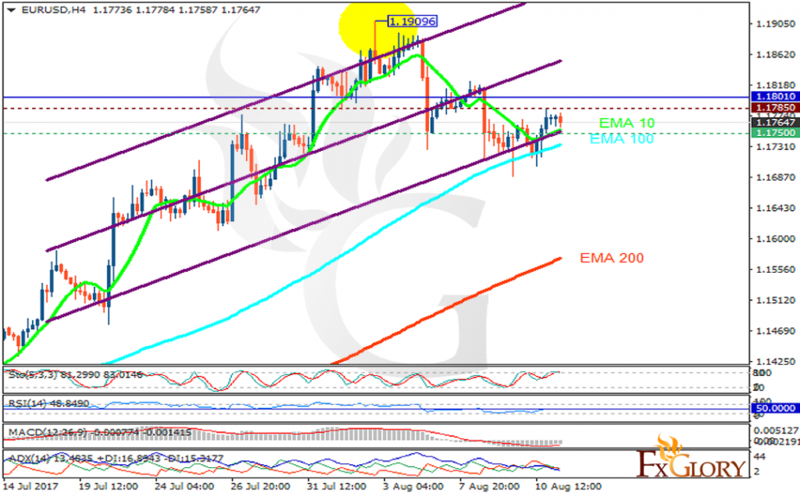 The support rests at 1.17500 with resistance at 1.17850 which both lines are below the weekly pivot point at 1.18010. The EMA of 10 is moving with bullish bias along the ascendant channel and it is above the EMA of 200 and the EMA of 100. The RSI is rising towards the 50 level, the Stochastic is moving in high ranges and the MACD indicator is in negative territory. The ADX is not showing any clear signals. EURUSD will continue its long term bullish bias towards 1.1820 creating an opportunity for sellers to target 1.16.